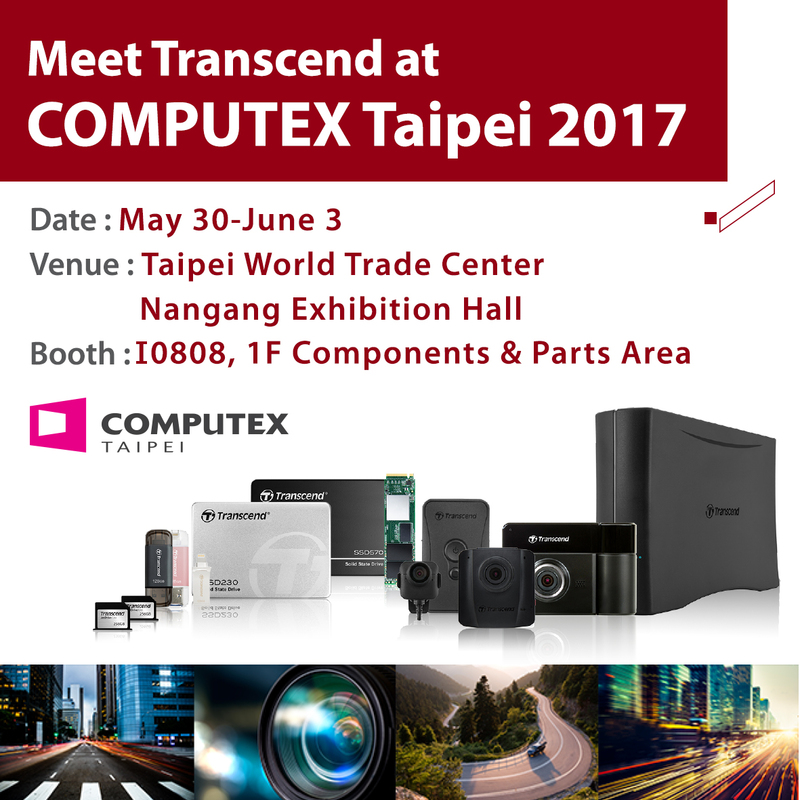 Transcend Information, a worldwide leader in storage, multimedia, and industrial products, announced that it will be exhibiting at COMPUTEX TAIPEI 2017 from May 30 to June 3 at the Taipei World Trade Center Nangang Exhibition Hall in Taipei, Taiwan. This year, Transcend will highlight five main categories-high speed PCIe and 3D NAND solid-state drives, dashcams and body cameras, Apple upgrade solutions, personal cloud storage devices, and a broad portfolio of embedded storage solutions, and will offer on-site demonstrations at booth I0808. This year, Transcend will showcase its complete line up of 3D NAND solid-state drives, including 2.5-inch, M.2, and embedded-use SSDs, all of which feature excellent performance, transfer rates, and reliability. Transcend's latest MTE850 PCIe Gen 3 x4 NVMe M.2 SSD, crafted with 3D MLC NAND flash, will also be on display. Thanks to 3D NAND technology and the next-generation PCIe NVMe protocol, the MTE850 SSD achieves never-before-seen transfer speeds and unquestionable reliability, making it perfect for both gaming and enterprise use. Transcend will also present its new range of dashcams and body cameras at COMPUTEX. The new DrivePro dashcam series utilizes Sony Exmor™ image sensors for high definition video capture even in low light conditions. Live demonstrations will highlight useful features to enhance driver safety, including headlight reminder, driver fatigue alert, and time-lapse video recording. Transcend’s body cameras are designed for law enforcement and other professionals’ needs to collect video evidence while on duty. The newly released DrivePro Body 30 body camera allows for up to 12 hours of recording on a single charge, supports Bluetooth and Wi-Fi connectivity for browsing snapshots and live streaming videos on mobile devices, and comes with four infrared LEDs which enhance night vision capabilities. Meanwhile, IP67 environmental sealing allows it to withstand the harsh conditions public safety professionals often encounter. As a leader in providing memory and storage solutions for iOS and Mac products, Transcend is dedicated to providing users with a variety of upgrade solutions. During this year’s COMPUTEX, Transcend will display a comprehensive portfolio of Apple-compatible products comprised of four product categories, including JetDrive Go Lightning flash drives and RDA2 smart card readers that expand iPhone and iPad storage, JetDrive Lite expansion cards aimed at MacBook Pro with Retina display and MacBook Air users, JetDrive SSD Upgrade Kits for MacBook laptops, and StoreJet for Mac Thunderbolt portable hard drives and SSDs. These Apple Solutions feature simple yet elegant designs that complement Apple products, and have received both the prestigious Good Design Award in Japan and the Taiwan Excellence Award. Transcend will display its mobile-access-friendly StoreJet Cloud personal cloud storage device and demonstrate its auto backup function that works across multiple platforms as well as its home media streaming capabilities. Visitors can experience seamless media streaming of videos, movies, or photos from Transcend’s StoreJet Cloud to mobile devices, laptops, and smart TVs, and remotely access their personal cloud device with Transcend’s exclusive iOS and Android apps. Transcend also offers a wide range of embedded-use products including solid-state drives, DRAM memory modules, and microSD and CF cards. This year, Transcend will showcase innovative applications for health care, transportation, military, and gaming, highlighting the stability and compatibility of its products for a wide array of embedded applications. Transcend will also conduct on-site demonstrations of SuperMLC, Hardware Purge, and Intelligent Power Shield. In addition, its SSD Scope Pro software, Security Encryption technology, and conformal coating technology will be shown as static demonstrations.